Whether you’re planting a church, sprucing up an old sanctuary, or replacing old and damaged church chairs, you want to be smart about your purchase. Sure, saving money is very important, especially if buying church chairs is one of many tasks on your to-do list, but you don’t want to get carried away. When looking for cheap church chairs, you want to be wary of prices that are so low, they seem too good to be true. Typically, if a low-cost church chair seems enticing, you should remember and be aware of the following five things. When looking to buy church chairs, you want to have a rather sizeable budget, just in case. Depending upon the type of chairs you’re looking for and the amount, you could be spending between $10,000 and $30,000 for the entire purchase. While this may seem expensive, it’s really an average price for a high-quality church chair from a great provider. When working with Bertolini, for example, the price may be around this number (or actually be lower) for 200+ chairs that are sturdy, sustainable, and locally sourced. If you find chairs in bulk below this amount, you may want to do some consideration before you sign any checks or give out your credit card information. In fact, there are five main things to be aware of that may save you from making a poor purchase. First and foremost, a low-cost cheap church chair is likely going to be of low quality. This can mean anything from how it looks and feels, to how efficient it is at doing its job. There’s nothing worse than a poor-quality chair, and the cheaper the chair is, the lower the quality is likely to be. 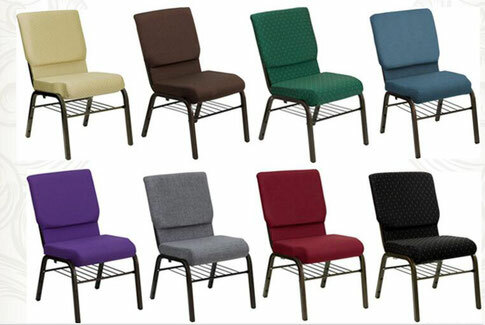 If you find individual church chairs to be below $50-$60 per chair, chances are they aren’t chairs worth buying. Looking out for the environment is extremely important, so you don’t want to purchase cheap church chairs that are harmful to people and the earth. This goes hand in hand with a cheaper church chair being of lower quality. Part of the quality lies in the materials used to create the chair. A quality chair will likely come with locally sourced materials such as steel, high-quality fabric, and are built to last long after every use. A cheap church chair will likely use lesser materials that may get the job done, but not for long. Church chairs are not just used for Sunday morning services. In a typical church, there are members and staff coming in and out for meetings, events, and practices almost every day of the week. This means that the church chairs are getting much more use than just a service once a week. With this in mind, you want church chairs that can endure heavy use for at least a decade before they need to be replaced. Cheap church chairs have a higher chance of wearing out, becoming damaged, or breaking after a few years due to their lower quality materials. This means you could end up spending more money over time because you have to replace your chairs much sooner than usual. When working with a company with suspiciously low prices, you have to wonder if the company itself is very trustworthy. Again, any company is going to charge a reasonable amount for their high-quality product. If you find low prices that seem too good to be true, chances are you’re getting just what you’ve paid for. Always do research before settling on a company that’s going to take a big investment. Even if you have to spend a little more, finding a company that’s trustworthy and meets all your needs is better than a rip-off any day! Finally, when looking for cheap church chairs, you must think about comfort. Comfort is such a huge factor when it comes to any type of seating that you really can’t overlook it. Think about it—if you’re at an event, at the movies, in a meeting, or anywhere else and your chair is uncomfortable, chances are your attention is mainly going to be on how uncomfortable you’re feeling. In a church setting, this could mean that your congregation misses out on a good message they would have absorbed if only the chair had just been a little cozier. Cheap church chairs will save you money, but they come with a number of problems that will haunt you in the long run. In your quest to save money, you don’t want to purchase a product that’s much more trouble than its worth. Think about the above five factors before settling on cheap church chairs. It might be worth it to spend a little extra in the end.